Turkey has bluntly rebuffed Donald Trump’s warning over its actions in Kurdish areas in northern Syria. Since autumn 2015, the US has supported the Syrian Democratic Forces, in which the YPG militia is the leading faction, in a campaign to push back the Islamic State in northern and eastern Syria. But Turkey considers the Syrian Kurdish Democratic Union Party (PYD) and its YPG force as part of the Turkish Kurdish insurgency PKK. 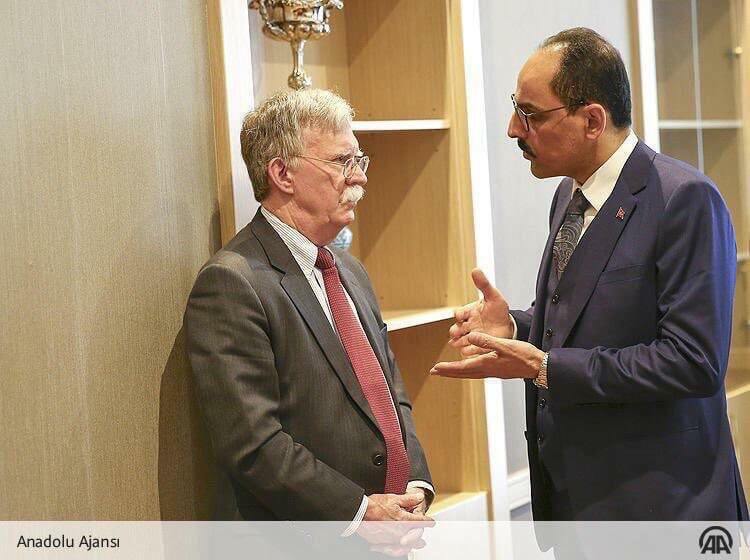 Last week Turkish President Recep Tayyip Erdoğan refused to see US National Security Advisor John Bolton in Ankara, after Bolton and Secretary of State Mike Pompeo told Turkey not to attack Kurdish territory, about 27% of Syria. Despite US-Turkish talks scheduled for this week, further confusion has been spread by conflicting American messagees over Trump’s withdrawal. Bolton said last week that it was conditional on total defeat of the Islamic State and assurances of Kurdish safety, indicating these might require months or even years. But Pentagon said it had begun to pull out some equipment, and Pompeo put out vague statements that withdrawal will be completed. You’ll have to ask the President. We have applied economic sanctions in many places, I assume he is speaking about those kinds of things. The Turkish Presidency said Trump and Erdoğan spoke by phone on Monday. It said the discussion was on the creation of a safe zone in northern Syria which had been cleared of militia, and maintained that both leaders agreed nothing should block the planned US withdrawal. There was no clarification of Trump’s reference to a “safe zone”. The Obama Administration spent years of indecision from 2012 over a zone protecting opposition areas from Assad regime attacks, failing to pursue any initiative. Pompeo also did not indicate how such a zone could be achieved if the US is absent from northern Syria. He said the US wants to provide security for those who have fought the Islamic State and to prevent any attack on Turkey from Syria. Turkish Foreign Minister Mevlüt Çavuşoğlu said Ankara is not against the idea of a safe zone, but implicitly chided Trump as he said allies should not communicate via social media. The commander of Kurdish led-forces in Syria tells @NBCNews he sent a delegation to Moscow about a week after Trump’s announcement. “I can assure you Russia is happy to fill the void left by the American military withdrawal,” he said. The warning from Turkey’s foreign minister to France against keeping its forces in Syria should be treated in fact as a signal for European powers to replace the 2,000-strong US contingent with a deterrent force of their own to help the Kurdish-led Syrian Democratic Forces (SDF) maintain the status quo. U.S. troops could be replaced by private mercenaries after withdrawing from northern Syria, U.S. private security firm Blackwater’s former chief Erik Prince has said in an interview with Fox Business. “The United States doesn’t have a long-term strategic obligation to stay in Syria. But, I also think it’s not a good idea to abandon our allies,” the Independent’s Richard Hall quoted Prince as saying during the interview. Prince’s suggestion of replacing the approximately 2,000 U.S. special forces deployed in northern Syria with contractors is a potential compromise that would allow U.S. President Donald Trump to hold to his vow to pull out troops while allaying concerns of top U.S. officials that doing so would leave his country’s Syrian Kurdish allies vulnerable to attack.